In the past year or so there has been a slew of high-level meetings pointing to antibiotic resistance as a growing threat to human well-being. But then, resistance was always an inevitable, Darwinian consequence of antibiotic use. Well before penicillin was widely available, Ernst Chain, who went on to win a Nobel Prize for his work on penicillin, noted that some bacteria were capable of neutralising the antibiotic. What is new about the recent pronouncements and decisions is that the use of antibiotics in agriculture is being recognised, somewhat belatedly, as a major source of resistance. Antibiotic manufacturers and the animal health industry have, since the start, done everything they can to deny that. Indeed, the history of efforts to regulate the use of antibiotics in agriculture reveals a pretty sordid approach to public health. But while it can be hard to prove the connection between agriculture and a specific case of antibiotic resistance, a look at hundreds of recent academic studies showed that almost three quarters of them did demonstrate a conclusive link. Antibiotic resistance – whether it originates with agriculture or inappropriate medical use – takes us back almost 100 years, when infectious diseases we now consider trivial could, and did, kill. It reduces the effectiveness of other procedures too, such as surgery and chemotherapy, by making it more likely that a subsequent infection will wreck the patient’s prospects. So it imposes huge costs on society as a whole. Maybe society as a whole needs to tackle the problem. The Oxford Martin School, which supports a portfolio of highly interdisciplinary research groups at Oxford University, has a Programme on Collective Responsibility for Infectious Disease. They recently published a paper proposing a tax on animal products produced with antibiotics. Could that possibly work? The paper by Alberto Giubilini and his colleagues is Taxing Meat: Taking Responsibility for One’s Contribution to Antibiotic Resistance. He also wrote an article explaining why we should tax meat that contains antibiotics. Claas Kirchhelle’s paper on the history of antibiotic regulation in Britain will be published in the Bulletin of the History of Medicine. His prize-winning D.Phil thesis Pyrrhic Progress – Antibiotics and Western Food Production (1949–2013) will be published by Rutgers University Press. Reducing antimicrobial use in food animals, published in Science after I had talked to Alberto and Claas, has some interesting things to say about a tax on antibiotics and other ways to tackle antibiotic resistance. The UK government’s Review on Antimicrobial Resistance is a valuable source of information. 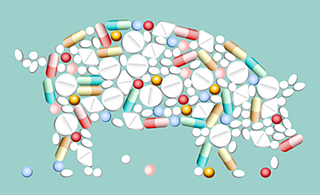 Pig pill image from the National Academy of Medicine. Banner image of methicillin-resistant Staphylococcus aureus from the Wellcome Trust. Love your podcasts! I met you at SeedSavers Exchange at a Campout you were a speaker(you lived in Italy then). We had a lovely conversation over some local beer. I have enjoyed following you. My group is SeedSavers-KC.org. I shared on our FB group. Great podcast on antibiotics-love the taxation idea! Thanks KC; glad you are enjoying it all. Jeremy Cherfas mentioned this article on stream.jeremycherfas.net. Susan MacMillan liked this article on twitter.com. Oxford Martin School liked this article on twitter.com. New podcast featuring @AlbertGiubilini & Claas Kirchhelle on taxing meat with antiobiotics and current use of agricultural antibiotics. Antibiotic resistance is one consequence of feeding animals large amounts of antibiotics -- about three times the amount given to people in the US. Why is it so hard to regulate the use of antibiotics in agriculture, and how else might we tackle the problem?